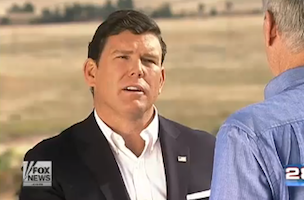 FOX News Channel’s Bret Baier anchored “Special Report” last night live from Denver, Colo., with a mountainous background much different than his usual in DC. Baier and his team hit the road to cover the upcoming Senate race between democratic Sen. Mark Udall and GOP challenger Rep. Cory Gardner. A Real Clear Politics poll has the candidates nearly tied, with Gardner at 45.2% and Udall at 44.6%. During the program, Baier brought in a panel including local KDVR anchor Eli Stokols, The Denver Post’s John Frank, and the AP’s Nick Riccardi.